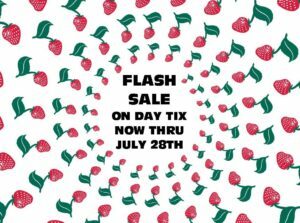 You can get your Day & Evening tickets for Fall Strawberry, at Flash Sale prices, now through July 28th. The Flash Sale price tier is a great deal, offered for a very short time, so don’t wait to get your discounted tickets. In addition to the 2 for 1 Special going on Thursday Evening tickets, this year we are offering a 2 for 1 special on kids & teens tickets good all day, any day of the festival. Combined with Flash Sale saving, families can save big by buying early. You can get discounted tickets online 24/7 or call our office M-F, 9-5 at (209) 984-8630.